Effective commissioning requires providers who bring depth of knowledge and experience to the project. Cx Associates' Principals Jennifer Chiodo and Matt Napolitan, have over 35 years' combined experience in building design, construction, and operations. Since our firm is small, you know that we will be directly involved in and responsible for the project work. Our expertise in Measurement & Verification allows us to go beyond traditional commissioning. 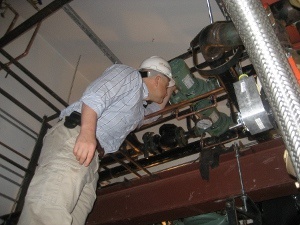 We can use our metering equipment to supplement information gathered through test equipment and the DDC and for project pursuing the LEED M&V Credit, we have the experience and expertise to simplify the process while ensuring the right data is available to track project performance over time. For LEED M&V Projects, we work with our clients to establish the objectives of undertaking the M&V effort and ensure a comprehensive M&V approach is taken. We detail the M&V requirements, work with the design team to ensure systems are set up for tracking, draft an M&V plan, work with the customer to ensure the funding and personnel will be in place to implement the plan, verify that the design and construction meets the M&V requirements outlined in the plan and commission the final M&V system. By pairing our M&V capabilities with our commissioning rigor, building owners can be confident that they have an M&V system in place that not only achieves three LEED credits for new construction via LEED EAc5, but is comprehensive, has been verified to be accurate and meets the needs of the building owner. I've worked with Cx Associates on two major projects; Aiken Hall, certified LEED Gold, won awards for historic preservation and Perry Hall is expected to win AIA awards as well as achieve LEED Platinum. Due to the demands of the restoration and sustainability, we needed commissioners with strong senses of building aesthetics, attention to details, and project coordination - Cx Associates met those needs"
You guys are the greatest construction resource since the rechargeable drill. Thanks for your help." -Jeffrey P. Carlson, Sr. Project Manager at Engelberth Construction Inc.
We appreciate the herculean effort given for the commissioning at Heater Road and the level of scrutiny and detail provided." -Perry Seale, Director of Facilities at Hypertherm Inc. I appreciate Cx Associates’ ability to provide us with that extra set of eyes during the design review process. Cx Associates’ ability to dedicate their time and expertise is like an insurance policy for us. It gives me the confidence to know our design engineers have done an adequate job and that they haven’t missed anything. Investing ahead of time eliminates problems and additional costs during the project."